Yes Rectangles can indeed fly! .... I don't know where GW gets its ideas for Space Marine flyers from but i think they need to look elsewhere. The Imperial Guard, Necron, hell even the Ork flyers all look decent and some (like the Valkyrie) look fantastic. But so far the Space Marnie flyers look like boxes with engines and a few vague wing shapes stuck on the side. And of course week 1 and no sign of the codex, i think at this point with the Ork, Imperial Guard and Dwarf army books/codexs following suit we can safely assume this is the new GW release plan for an army, with all the new models coming out early in the month and the codex coming last/second to last. I don't like that release plan and am thankful all my armies have current edition army books/codexs out. Until next time. I think they are trying to add bulk without wingspan. Its hell transporting flyers from the guard, these look easy to lug around. But its just the wings that need fixing and it could look fine. It looks like a flying penguin (chunky body, little swimming feathers) rather than a bird of flight. I dont see the Pelican as remotely believable but the pelican has wingspan. Which the SM flyer doesnt. Wingspan however is not functional with the model transporting. It just looks like GW wanted a flyer that could easily be transported but look bulky. And the result is uglyness. No wingspan makes it look like it was launched into the air and doesnt actually fly. Kinf of. Thats all I meant. All it needs is more wingspan is pretty much my point. My issue with it is that it doesn't look sleek, aircraft cut through the air not bludgeon their way through it. That and it doesn't look right for a chapter of marines that venerate wolves, wolves are sleek and deadly and that transport would be better suited in say the Imperial Fists or Iron Hands Chapter. 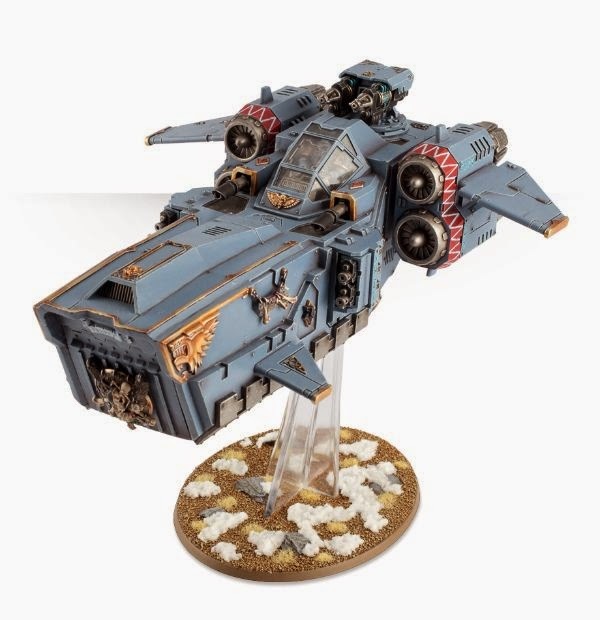 If they had made a sleek transport that you could imagine cutting through the air then that would have suited the Space Wolves better. I agree, sleek would help a lot. But personally im more for wingspan first. You will be surprised at what can fly with a decent wingspan! I think its an improvement over the other SM flyers, but yep. Still damn ugly. Totally of topic Rex but I don't have your email address.